Raphidophycean flagellates Chattonella marina, first reported in India in 1954, is a highly toxic species causing harmful algal blooms (HABs) associated with massive mortality of wild and cultivated fish in Japan, China and Australia[1-3]. Several bioactive compounds have been found in cultures of raphidophytes: reactive oxygen species, brevetoxin, free fatty acid, nitric oxide, hemagglutinins and hemolysins. However, some studies have rebutted that the ROS and brevetoxin were not the ichthyotoxins of C. marina[9,10]. Besides, there are no direct evidences to indicate that the hemolysis and oxidation of hemoglobin do occur in C. marina exposed fish. Therefore the ichthyotoxic mechanism of C. marina is still highly controversial and the reason why some fish can survive in exposure of C. marina is also unclear. The susceptibilities of different fish species exposed to C. marina had been investigated, including goldlinedseabream (Rhabdosargussarba), Russell’s snapper (Lutjanusrussellii), marine medaka (Oryziasmelastigma), green grouper (Epinepheluscoioides), red seabream (Pagrus major), yellowtails (Seriolaquinqueradiata) and damselfish (Acanthochromispolycanthus). Toxic effect of C. marina on fish was mainly inducing gill damage, the subsequent fermentable fuel exhaustion was the major cause of fish death. Teleost Siganus spp. are tolerant to various environmental stresses such as high concentration of aqueous ammonia, aqueous nitrite, a wide range of temperature, salinity, and marine white spot disease[19-20]. Moreover, it is an excellent food which has been widely cultured in the Mediterranean and Indo-Pacific Regions. The rabbitfish, Siganusoramin, with a wide geographic distribution, can be utilized as a good bio-indicator for quick monitoring on the local environmental condition. Rabbitfish were adopted in this study to explore their responses to the exposure of toxic C. marina. Parameters in physiology (respiratory rate), histopathology (gill histology) and biochemistry (hematology) were investigated. The findings can hopefully contribute to develop better HABs management strategies in fish farming. The rabbitfish (length: 10.2 ± 1.1 cm, weight: 12.0 ± 4.3 g) were captured from Ma Liu Shui Public Pier, Hong Kong. The fish were raised in the tank with fully aerated local sea water (salinity 33 ± 2%). They were fed with common fish food every other day and the sea water was renewed once a week to keep good water quality. Feeding was ceased 2 days prior to the exposure experiments. The raphidophyte Chattonella marina (Subrahmanyan) Hara et Chihara (NIES-3) was provided by the National Institute of Environmental Studies (NIES), Japan and maintained in modified K medium with a salinity of 33 ± 2%, and kept at 25 ± 1°C at a photon flux density of 100 μm photons m-2s-1 in a 12:12h light:dark cycle. The illumination was provided by cool white fluorescent lamps. To ensure the observed effect was caused by C. marina toxicity but not the physical disturbance of the algal cells, a non-toxic alga, Dunaliellatertiolecta was used as negative control. The maintenance condition of D. tertiolecta was the same as C. marina. The exposure experiment was divided into three groups, C. marina (CM) as treatment, while seawater (SW) and D.tertiolecta (DT) as controls. For the algal culture, C. marina was cultured in 2 L plastic tank until reached the mid-log growth phase (around 10,000 cells mL-1) which was in the most toxic stage. D.tertiolecta was also cultured in the same condition as C. marina until the cell density reached around 10,000 cells mL-1. For each group, ten fishes were used (one fish in a tank, n = 10). Fish mortality, frequency of operculum movement (indicator of respiratory rate), gill histology and blood glucose level of all groups were also monitored. The whole exposure took 48 hours. The frequency of operculum movement was measured for 1 min at: the very beginning, 6h, 24h, and 48h of the exposure. During the 48h exposure, the moribund fish (showing intoxication symptom, e.g. imbalanced swimming or lying on the bottom of the tank) in CM exposure was removed immediately for blood collection and gill histological examination. The survival fish from the CM exposure were all sampled after 48h exposure together with the ones from SW and DT controls. All sampled fish were put in the ice bath to lower their activity, and the blood was collected from caudal vein by syringe. The blood samples were immediately centrifuged 10,000 rpm at 4°C for 1 min to obtain the serum. The blood glucose concentration in serum was analyzed by glucose assay kit (Biovision, K606). The fish gill arches were cut and the gill filament were then separated carefully and examined under light microscope. To determine the lethal level of blood glucose caused by hypoxia, a hypoxia experiment was conducted. The fishes were put into the tank and a plastic bag was covered on the sea water surface to prevent gaseous exchange. The blood was collected until the fish showing hypoxia symptom (e.g. lying on the bottom), and then blood glucose level was determined by using glucose assay kit (Biovision, K606). One-way ANOVA and S-N-K post-hoc test were used to test the null hypothesis that there was no significant difference between the means of each parameter in three experimental groups. Statistical analysis was performed using SPSS 17.0. The level of statistical significance was set at p < 0.05. The respiratory rates (indicated as operculum movement rate) of rabbitfish in all groups were decreasing with time (Figure 1). No significant differences were observed among three groups at 6 h and 24 h, respectively. 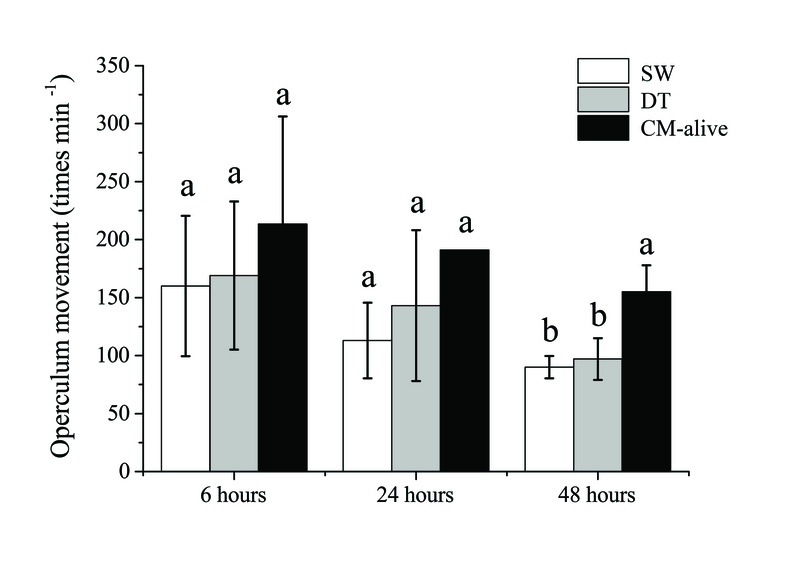 At 48 h, the frequency of operculum movement of rabbitfish exposed to C. marina was significantly higher than thosein DT and SW controls, but no significant difference was observed between DT and SW controls. The significant higher respiratory rate of rabbitfish exposed to C. marina indicated that Rabbitfish suffered stress caused by the toxic effect of C. marina. In previous studies, the fishes had distress and their LT50 were within few hours[6,12-14]. In this study, the mortality of rabbitfish exposed to C. marina was only 30%. The present study shows rabbitfish was tolerant to toxic C. marina to certain extent. It reveals rabbitfish might partially avoid the harmful effect of C. marina in the wild. Figure 1: Respiratory rate of Siganusoramin during the exposure to seawater (SW), Dunaliellatertiolecta (DT), and Chattonella marina (CM) at 6h, 24h, 48h (Mean ± Standard Deviation, one way ANOVA, S-N-K test, p < 0.05). 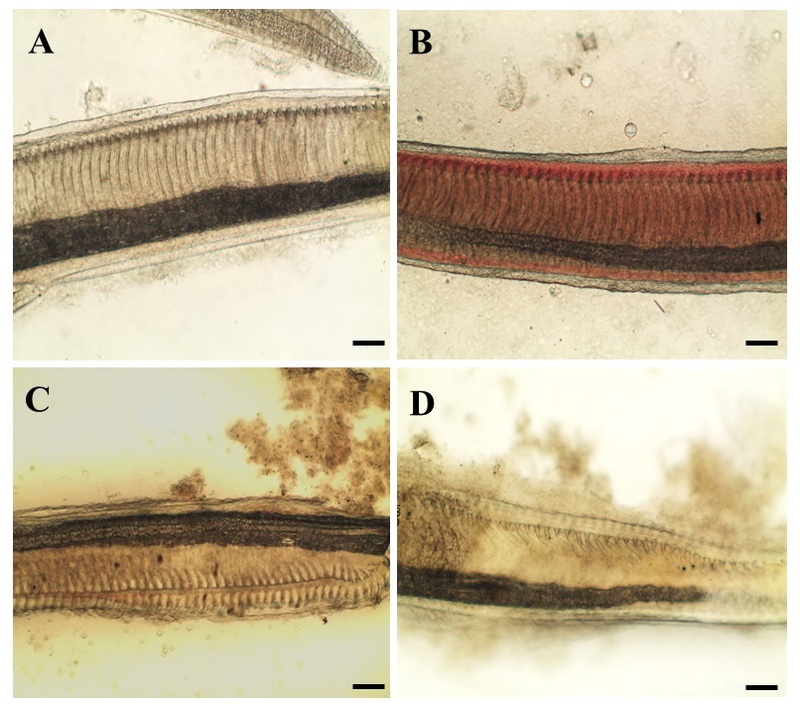 Examining the status of rabbitfish gill filaments under light microscope (Figure 2), no irregular filament was observed in Sword groups while part of the filament in CM treatment showed irregularity. There was significantly higher ratio of irregular filament in moribund fish as compared to the fish a live in C. marina treatment (Figure 3). The filament (and lamella) was designed to maximize gill surface area for oxygen loading to the blood and to minimize water-blood diffusion distance. Gill damages observed in this study indicates gill surface area for gaseous exchange in rabbitfish was reduced after exposed to C. marina. It showed that rabbitfish had difficulty in respiration due to gill damage, so that it increased operculum movement rate to obtain more oxygen. This should be the reason why rabbitfish had higher respiratory rate in C. marina exposure as compared to the control groups at 48h. However, the mechanism of gill damage by C. marina is not clear. It is necessary to further investigate how gill damage is induced by C. marina. Figure 2: Gill of Siganusoramin exposed to seawater (SW), Dunaliellatertiolecta (DT) and Chattonella marina (CM) under light microscope. Gill filaments in SW (A), DT (B), CM-alive (C) and CM-mrb(D). Alive fish in CM (CM-alive); Moribund Fish in CM (CM-mrb). Scale bars = 100 μm. Figure 3: Ratio of irregular lamella in Siganusoramin exposed to seawater (SW), Dunaliellatertiolecta (DT), and Chattonella marina (CM). Alive fish in CM (CM-alive); Moribund Fish in CM (CM-mrb) (Mean ± Standard Deviation, one-way ANOVA, S-N-K test, p < 0.05). 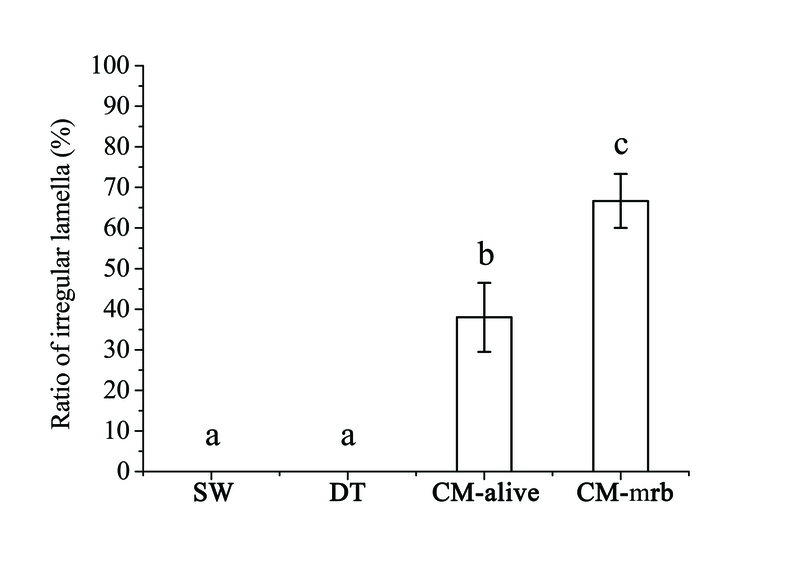 Significantly lower blood glucose concentration was found in C. marina exposed moribund fish (CM-mrb) as compared to the fish alive in CM, DT and SW groups (Figure 4). It revealed the moribund fish from C. marina exposure suffered more stress. Based on the respiratory rate and gill histological findings, higher frequency of operculum movement and gill damage of rabbitfish only occurred in C. marina exposed fish. These two factors indicated that C. marina exposed rabbitfish was under respiratory distress. Besides, severer gill damage was observed in the moribund fish as compared to fish alive in C. marina exposure (CM-alive), the subsequent declined oxygen uptake put more stress on the moribund fish. On the other hand, the lethal blood glucose level was determined by the hypoxia(HYP) experiment, no significant difference was found between blood glucose levels of CM-mrb and HYP (Figure 4). Hence, the reason for fish death caused by C. marina should be that fish had much severe respiratory distress which leads to more glucose consumption till reaching lethal level eventually, as agreed by another study. Figure 4: Blood glucose concentration of Siganusoramin exposed to seawater (SW), Dunaliellatertiolecta (DT), Chattonella marina (CM) and hypoxia (HYP). Alive fish in CM (CM-alive), Moribund Fish in CM (CM-mrb) (Mean ± Standard Deviation, one-way ANOVA, S-N-K test, p < 0.05). Previous study suggested the fish with high respiratory rate (101 ± 12 times min-1) might be sensitive to C. marina, because the rapid gill disturbance led to the anaerobic respiration and the subsequent fermentable fuel exhaustion cause quick death. In this study, rabbitfish also had a relative high respiratory rate (90 ± 10 time’s min-1, in SW control) but its mortality in CM treatment was low. Consequently, rabbitfish was believed to have unique characteristic to resist the toxicity of C. marina, in which its gill protection ability might be the key. In summary, this study demonstrated that the toxicological response of rabbitfish to the exposure of C. marina. Gill damage was the crucial cause of fish death. The results revealed that only a small portion of C. marina exposed rabbitfish had a significant gill damage and most of the rest had much less gill damage and eventually survived. Nevertheless, the gill protection ability of rabbitfish as a mechanism against the toxic effects of C. marina is still unknown. It is essentially necessary to further investigate the mechanism of gill protection mechanism, which may help develop better HAB management strategies in fish farming when facing the threat from Chattonella harmful algal blooms. Appreciations go to Dr. Meng YAN for helping the revision of manuscript from City University of Hong Kong. 1. Landsberg, J.H. The effects of harmful algal blooms on aquatic organisms. (2002) Rev Fish Sci 10(2): 113-390. 2. Wang, Z.H., Yuan, M.L., Liang, Y., et al. Effects of temperature and organic and inorganic nutrients on the growth of Chattonella marina (Raphidophyceae) from the Daya Bay South China Sea. (2011) Acta Oceanol Sin 30(3): 124-131. 3. Imai, I., Yamaguchi, M. Life cycle, physiology, ecology and red tide occurrences of the fish-killing raphidophyte Chattonella. (2012) Harmful Algae 14: 46-70. 4. Liu, W., Au, W.T., Anderson, D.M., et al. Effects of nutrients, salinity, pH and light:dark cycle on the production of reactive oxygen species in the alga Chattonella marina. (2007) J Exp Mar Biol Ecol 346(1-2): 76-86. 5. Bourdelais, A.J., Tomas, C.R., Naaret, J., et al. New fish-killing alga in coastal Delaware produces neurotoxins. (2002) Environ Health Persp 110(5): 465-470. 6. Marshall, J.A., Nichols, P.D., Hamilton B, et al. 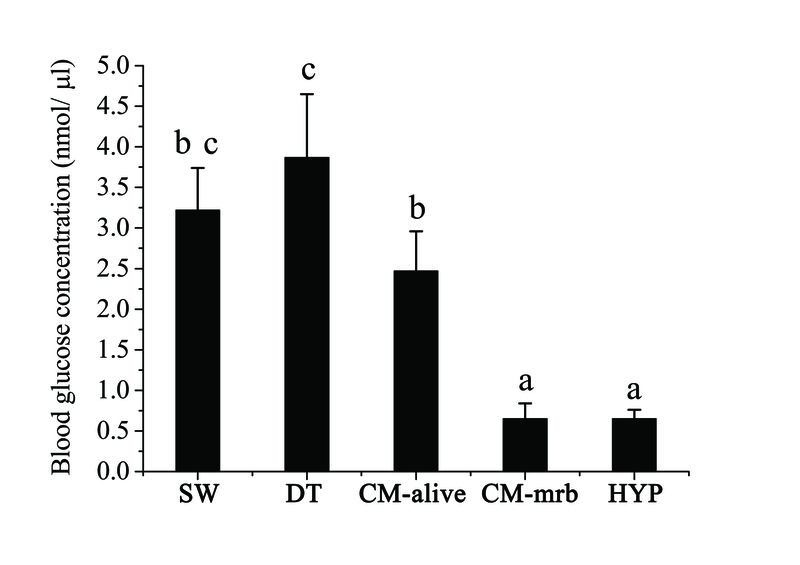 Ichthyotoxicity of Chattonella marina (Raphidophyceae) to damselfish (Acanthochromis polyanthus): the synergistic role of reactive oxygen species and free fatty acids. (2003) Harmful Algae 2(4): 273-281. 7. Kim, D., Yamaguchi, K., Oda, T. Nitric oxide synthase-like enzyme mediated nitric oxide generation by harmful red tide phytoplankton, Chattonella marina. (2006) J Plankton Res 28(6): 613-620. 8. Kuroda, A., Nakashima, T., Yamaguchi, K., et al. Isolation and characterization of light-dependent hemolytic cytotoxin from harmful red tide phytoplankton Chattonella marina. (2005) Comp Biochem Phys C 141(3): 297-305. 9. Tang, J.Y., Anderson, D.M., Au, D.W. Hydrogen peroxide is not the cause of fish kills associated with Chattonella marina: Cytological and physiological evidence. (2005)Aquat Toxicol 72(4): 351-360. 10. Shen, M., Xu, J.L., Tsang, T.Y.,et al. Toxicity comparison between Chattonella marina and Karenia brevis using marine medaka (Oryzias melastigma): Evidence against the suspected ichthyotoxins of Chattonella marina. (2010) Chemosphere 80(5): 5855-5891. 11. Shen, M., Xu, J.L.,et al. Unravelling the pathway of respiratory toxicity in goldlined seabream (Rhabdosargus sarba) induced by the harmful alga Chattonella marina. (2011) Aquat Toxicol 104(3-4):185-191. 12. Shen, M., Xu, J.L., Chan, A.K.,et al. Susceptibility of fish to Chattonella marina is determined by its tolerance to hypoxia. (2011) Mar Pollut Bul 63(5-12): 189-194. 13. Endo, M., Onoue,Y., Kuroki, A., et al. Neurotoxin-Induced Cardiac Disorder and Its Role in the Death of Fish Exposed to Chattonella marina. (1992) Mar Biol 112(3): 371-376. 14. Ishimatsu, A., Oda, T., Yoshida.M., et al. Oxygen radicals are probably involved in the mortality of yellowtail by Chattonella marina. (1996) Fisheries Sci 62(5): 836-837. 15. Roumieh, R., Barakat, A.,et al. Acute and chronic effects of aqueous ammonia on marbled spinefoot rabbitfish, Siganus rivulatus (Forsskal 1775). (2013) Aquac Res 44(11): 1777-1790. 16. Saoud, P., Ghanawi, J.N.S. Effects of Acute and Chronic Nitrite Exposure on Rabbitfish Siganus rivulatus Growth, Hematological Parameters, and Gill Histology. (2014) Journal of Aquaculture Research & Development 05(6). 17. Saoud, I.P., Mohanna, C., Ghanawi,J., et al. Effects of temperature on survival and growth of juvenile spinefoot rabbitfish (Siganus rivulatus). (2008) Aquac Res 39(5): 491-497. 18. Saoud, I.P., Kreydiyyeh, S., Ghanawi, J., et al. Influence of salinity on survival, growth, plasma osmolality and gill Na+-K+-ATPase activity in the rabbitfish Siganus rivulatus. (2007) J Exp Mar Biol Ecol 348(1-2): 183-190. 19. Wang, F.H., Li, R., Li, A., et al. The serum of rabbitfish (Siganus oramin) has antimicrobial activity to some pathogenic organisms and a novel serum L-amino acid oxidase is isolated. (2011) Fish Shellfish Immun 30(4-5): 1095-1108. 20. Wang, F.H., Xie, M.Q., Li, A.X., et al. A novel protein isolated from the serum of rabbitfish (Siganus oramin) is lethal to Cryptocaryon irritans. (2010) Fish Shellfish Immun 29(1): 32-41. 21. Lam, T.J. Siganids - Their Biology and Mariculture Potential. (1974) Aquaculture 3(4): 325-354. 22. Fang, J.K.H., Au, D.W.T., Chan, A.K., et al. The use of physiological indices in rabbitfish Siganus oramin for monitoring of coastal pollution. (2009) Mar Pollut Bull 58(8): 1229-1235. 23. Keller, M.D., Selvin, R.C, Guillard, R. R. L., et al. Media for the culture of oceanic ultraphytoplankton. (1987) Journal of Phycology 23(4): 633-638. 24. Shen, M. Fish kill mechanisms and toxins exploration for the harmful alga Chattonella marina. (2010) City University of Hong Kong. 25. Olson, K.R. Chapter 21 - Respiratory System A2 - Ostrander, Gary K. The Laboratory Fish. (2000) London: Academic Press p. 357-67. 26. Kreiberg, H. Chapter 29 - Stress and Anesthesia A2 - Ostrander, Gary K. The Laboratory Fish. (2000) London: Academic Press p. 503-11.